Hatters boss Mick Harford knows his side have to pay special attention to Blackpool striker Armand Gnanduillet this afternoon. The imposing forward is the Tangerines’ top scorer this season, with 14 goals in total so far. He also netted on his last outing at Kenilworth Road, as Blackpool drew 3-3 in the League Two play-offs back in 2017, knocking Town out 6-5 on aggregate. “They do play into his strengths and he is a handful when they get the ball in the box. 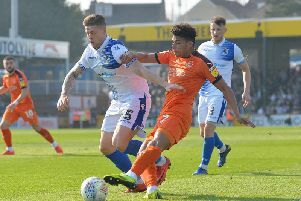 Despite Luton having painful memories of the last time Blackpool were in town, keeper Stuart Moore's stoppage time own goal sending them out of the play-offs, Harford didn’t think his side were necessarily looking for payback this afternoon. He continued: “I wouldn’t say revenge, it was a bit of a horrible night, a bit of a nightmare for us as a club. “We’d have gone into the play-off final, and it was a bit of a disaster at the end. “It’s another game for us, another game we need to win, need to chalk off and keep going. "I wouldn’t say revenge, but it’s a big challenge for us as they’re a dangerous outfit. With Blackpool six points adrift of the play-offs in eighth spot, but having secured some excellent results on their travels this term, Harford knows Town have to be at their best yet again. He added: “It’s going to be tough, we know that. “Blackpool have got a real good away record, they’ve beaten the likes of Portsmouth and drawn with Sunderland, so their away record is up there in the League One table on away performances. “We will not take anyone lightly, they’re a big, strong physical team who will make it very difficult. “They’ve got a lot of threats, so we’ll make our players aware of their strengths and weaknesses and we’ll take it from there. Promotion rivals Sunderland cut the gap on Luton to 10 points with a midweek win at Accrington, the Black Cats heading to Rochdale this afternoon. Harford admitted he will be keeping an eye on goings on at Spotland and Burton Albion, where second placed Barnsley are in action. He added: "It's inevitable, we will be watching them, we will be keeping an eye on their results, but we can’t affect them. "As I keep saying, we don’t know what’s going to happen, all we can do is affect the way we want to play, how we approach every game, and how we go about our business. "Sunderland deserve a bit of credit after Sunday (Johnstone's Paint Trophy final defeat to Portsmouth), they’d have been on a downer. "The manager’s got them back up and it’s a great result for them, fair play to them, it’s a difficult place to go and get a victory."